Squirrels, either 'ya love 'em, or 'ya hate 'em. There's no in between. Lots of people like to watch squirrels scamper about. This is especially true during the winter months, when there is less for us to do, and less wildlife around to watch. Squirrels do not hibernate or go south, like many other animals. Rather, they stick around just to entertain you! 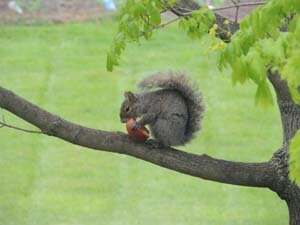 Many nature and bird watchers even feed squirrels. As a matter of fact, there are squirrel feeders designed to hold food for your cute, and all too active neighborhood squirrel. But, when it comes to the hobby of bird watching and bird feeding, the squirrel quickly becomes the arch nemesis. As I'm sure you already know, bird feeders are squirrel magnets. There is no better way to attract squirrels than to have a bird feeder. And, here is where the problem begins. In a single visit, one or more squirrels can empty a bird feeder. Not that they eat that much at one meal. Rather, they toss all the seed, except what they want, out of the feeder and onto the ground. Ground feeding birds find and eat a fraction of the leftovers. 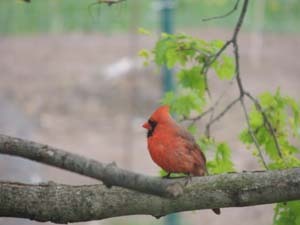 You can fill your feeder with Safflower seeds. Squirrels don't like them. But only a few varieties of birds will eat Safflower. Bird lovers go to great extremes to deter them, often without success. A wide array of feeders, squirrel domes, and baffles are available in this fight against our fine, furry friend. Fortunately, some of the devices are effective. Domes and baffles definitely deter these determined creatures. Bird feeders designed to keep them out work too, but usually come at a steep price. They also might keep some of your fine feathered friends away. When selecting the right tools in your battle against squirrels, we suggest the first line of defense is baffles and domes. We recommend you thoroughly investigate any bird feeders designed to keep squirrels away. Check around to make sure they are effective. You don't want to spend the money, if they can't deliver what they promise. Ridding your yard of squirrels is an other effective means of keeping them out of your feeders. But that is easier said than done. And, it is usually temporary. Once you have accomplished it, squirrels from your neighbors yard or fields, will migrate to this open territory. Find more information in how to eliminate squirrels from your yard.